Vanity Fair's Sarah Ellison is out with a dishy piece titled "The Inside Story of the Kushner-Bannon Civil War." While none of Ellison's top sources are named, the story clearly reflects the perspective of the moderate camp inside the West Wing — Jared, Ivanka, and Gary Cohn — and contains some brutal anonymous quotes hitting Steve Bannon and Kellyanne Conway in particular. Between the lines: Ellison's story is a useful guide to the shifting power dynamics within the West Wing: the loss of power of the Bannonites and the imminent "normalization" of staff. Why this matters: The West Wing's leak war is still very much alive, despite the President telling his senior staff to knock it off and work together. This situation is unsustainable and Bannon's job security isn't looking great. '"I'm not sure Steve does a lot of actual work," said one person in the Trump circle shortly before Bannon was removed from the National Security Council, a position he had enjoyed for fewer than 10 weeks. 'Bannon's real undoing in the eyes of his boss, according to three people familiar with the situation, involves his perceived attacks through the media against Kushner and Ivanka as liberal Democrats seeking to undermine a more conservative agenda. "He is very talented at making himself seem the hero of the conservatives who elected Donald Trump"..."The president sees through that kind of thing, and he's aware of what's happening." The official went on: "The reality is, if he keeps this up he's not going to be here." 'Similarly, the bungled implementation of the travel ban didn't win any points for Bannon. According to a senior official close to the president: "You could have told Homeland Security to really start doing their jobs. You didn't have to sign an executive order and piss in everyone's face." The most withering of the anonymous quotes are aimed at Conway. 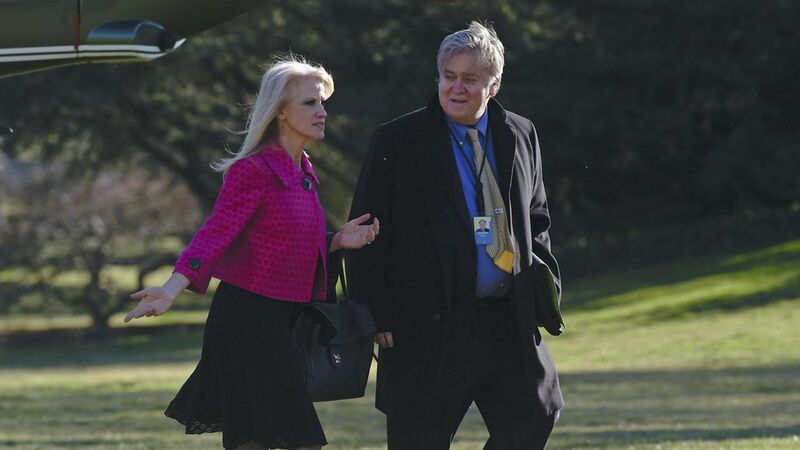 "Don't spend too much time on Kellyanne," the senior administration official [said], referring to the Cheerleader Gone Wrong character in this reality-TV tableau. "She's a harmless, sweet person, but she is less and less in the middle of it." "The way we dealt with her is that she's not in meetings anymore," according to a senior official close to the president. "That's how we dealt with that. So I'd say right now she's trying to figure out what her job is going to be."